Iran has begun installing next-generation equipment at one of its main nuclear plants, new IAEA report finds. Iran has begun installing next-generation equipment at one of its main nuclear plants, a new International Atomic Energy Agency (IAEA) report said Thursday. "On 6 February 2013, the Agency observed that Iran had started the installation of IR-2m centrifuges" at the Natanz plant, the report said, according to AFP. "This is the first time that centrifuges more advanced than the IR-1 have been installed" at the plant in central Iran, the UN atomic watchdog added. 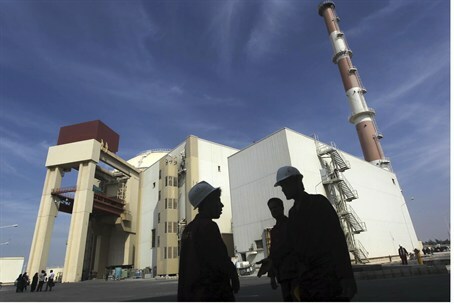 One official said that Iran intended to install around 3,000 of the new centrifuges at Natanz -- where around 12,500 of the older models are installed -- enabling it to speed up the enrichment of uranium. This process is at the heart of the international community's concerns about Iran's nuclear program, since uranium enriched at high levels can be used in a nuclear weapon. News of this advanced equipment drew an immediate reaction Thursday from Washington, which called it "yet another provocative step" by Iran. The installation "would be a further escalation and a continuing violation of Iran's obligations under the relevant UN Security Council resolutions and IAEA board resolutions," U.S. State Department spokeswoman Victoria Nuland said, noting however that the new centrifuges came as no surprise. Britain expressed "serious concern" about the latest development, with Foreign Office minister Alistair Burt calling it "another signal that Iran has no intention of providing the necessary reassurance... that its nuclear program is for purely peaceful purposes." Despite the developments at Natanz, the IAEA's quarterly report seen by AFP also noted that Iran has not started operating any new equipment at its underground Fordow plant. Fordow is of more concern to the international community, since it is used to enrich uranium to fissile purities of 20 percent and Natanz mostly to five percent. Iran has so far produced 280 kilos (617 pounds) of 20-percent uranium, of which around 110 kilos have been diverted to fuel production, the new report said. Experts say that around 250 kilos are needed for one bomb, although creating a weapon requires several other steps and if Iran were to start further enriching to weapons-grade this would be detected by the IAEA. The IAEA report comes several weeks after Iran informed the IAEA that it planned to speed up its uranium enrichment program, using faster and more advanced centrifuges. The report also came ahead of a new meeting between Iran and six world powers -- the U.S., China, Russia, Britain, France and Germany -- in Kazakhstan on February 26. These will be the first talks between the parties since three rounds of meetings ended in stalemate in Moscow last June. The so-called P5+1 called on Iran to suspend all 20-percent enrichment, shut down Fordow and export its 20-percent stockpile. Reports have said that the powers could ease sanctions on Iran's trade in gold and other precious metals. On Thursday, Nuland urged Iran to consider "another path" than the nuclear bomb. "They have an opportunity to come to those talks ready to be serious, ready to allay the international community's concerns, and we hope they take that opportunity," she said, according to AFP. Parallel efforts by the IAEA dating back more than a year to press Iran to grant it access to sites, documents and scientists involved in what the agency suspects were past efforts to develop nuclear weapons remain stalled. The new report said that "although the (IAEA) board has adopted two resolutions addressing the urgent need to resolve outstanding issues regarding the Iranian nuclear program, including those which need to be clarified to exclude the existence of possible military dimensions, it has not been possible to finalize the structured approach document or begin substantive work in this regard." It added however that the Vienna-based IAEA's "commitment to continued dialogue is unwavering". It said that Iran "has not fully implemented its binding obligations" and that this was "needed to establish international confidence in the exclusively peaceful nature of Iran's nuclear program."